Klevgränd's third and final ”release-per-month” plug-in is here, and it bears the explicit (yes it is - in Swedish) name "Kuvert". VirSyn’s new app for iPhone, iPod Touch and iPad takes you back to the analog tape echo era. IK Multimedia has launched at the AppStore a new app that features iconic studio microphone models for iPhone, iPod Touch and iPad. Korvpressor is a new compressor/limiter plug-in for Mac OS X and Windows as well as an iPad app, available now for a discounted price. 06/05/15 in Positive Grid Bias - Amps! 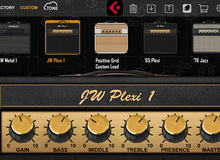 Positive Grid has released two updates for its Bias and JamUp iOS apps in order to add support for the Amp Match feature. Positive Grid has released an update for its Final Touch mixing and mastering app for iPad and offers a discount for a limited time.